Center-stage is a series of articles spotlighting a particular model or unit in Godslayer. In part eight we take a detailed look at the Demarchon, highlighting what he can do and some cool ways to use him in combination with other models. Epitomizing the martial prowess and honor of the Halodynes are the Demarchons – officers sworn to defend the City-States with their lives and their souls. Every Demarchon is a battle-hardened veteran with both strategic acumen and a strong spear arm. He is expected to lead from the front by example and is always an accomplished warrior of outstanding bravery. Equally vital, the Demarchon possess-es a philosopher’s intellect and comprehends how the diverse components of the Halodyne military work together to achieve victory. A Demarchon’s crimson career begins when he joins the professional warrior order of Halodyne socie-ty. This caste – called The Symachoi – are not merely professional soldiers, they are an entire social class making up around one-tenth of the society possessing a philosophical and martial code known as the Thesmos. Unlike the ecstatic rites of the Temple Warriors, the Thesmos is a measured ideology of restraint and self-discipline, defining a way of life for these champions of civilization. Experienced commanding forces of up to several hundred, Demarchons are also the officers of choice to lead contingents on special assignments such as reconnaissance, escorts and raids, or for commanding outpost garrisons. When not in the field, Demarchons train Halodyne soldiery and work to strengthen defenses. After a decade of service, some Demarchons seek their fortunes elsewhere, leading bands of adventurers and mercenaries. As we see from the card, the Demarchon is a warlord of the City-States sub-faction, so commander of other models such as the Hoplites, Hill Ogres and Syntarch. He is also a regular infantry warlord despite his pretty heavy armor, enabling him to make up to 4 movement actions per turn. MEL 8 – Good for a professional warrior, but there are warlords with 9. Not amazing stats for a warlord, but the Demarchon is normally equipped with a large shield and is expert in using it as part of his skills. What might be a hindering encumbrance to an untrained warrior is an integral part of the Demarchon’s nature, and as you will see, the large shield greatly improves his DEF and ARM stats. Also on his profile card are his life-points (14) which is the average for human warrior warlords. So if his stats are nothing special, what’s so special about this guy. Well as you will see, the Demarchon is not a 100% warrior Warlord; he is in fact what we call an all-rounder – good in melee but equipped with quite a few tactics and abilities for boosting his troops. He can be tooled-up to make him great in melee and can be used that way if a player wishes, or he can be kept out of the battle completely and tooled down to reduce points cost and used 100% as a supporter warlord, buffing his troops. Or you can use him as a typical all-rounder, enhancing troops during the bulk of the battle and throwing him into melee when it makes sense to do so, such as in the final rounds of the game or to take on the enemy warlord. Strong-Willed: the Demarchon may make one re-roll of any LEAD-based test. This sub-faction ability is useful for the other models and units but not so useful for the Demarchon himself since he already has LEAD 10 and has Hardened Will (because he is a warlord). However, it will sometimes be useful against things like Reek, enemy tactics, and some other spells/effects that require a LEAD test. Archilochos – A Demarchon’s training in all the arts of war enables him to join a phalanx formation. This is an incredible ability which allows him to increase his ARM by +2 at no cost in action tokens! Heroic Valor – Such a hero can motivate units to extraordinary performance during battle. This allows the Demarchon to assign an action token to a unit within 2 inches for free. This is particularly useful in rounds 3-6 when there are never quite enough action tokens to do everything you want. Reverence – Demarchons are surrounded by stories of daring exploits, inspiring confidence and discipline in their troops just by their mere proximity. Friendly models within LEAD-Range gain +1 LEAD. Doesn’t sound so special but when you combine that with the generally high LEAD of Halodyne models and the sub-faction ability allowing models to re-roll LEAD-based tests, you have a warband that is rock solid. Models and units will almost always pass fear and horror tests, allowing them to fight those foes normally. Additionally they will almost always pass bravery tests, so they will rarely flee! Such dependability is priceless. Ask any Gnoll player about that. Defiant in Death – Calling on his men to honor their duty to the city-state, the Demarchon swears oaths before the gods and inspires his men to fight for glory. Defiant in Death negates bravery tests and means your dead models are not removed until the end of the round. This enables them to fight during their own activation instead of forcing them to make counter-attacks. This has the great advantge that attacks made during their standard activation benefit from fighting styles and tactics. Another benefit is that models that are destroyed but not removed still bind the enemies. 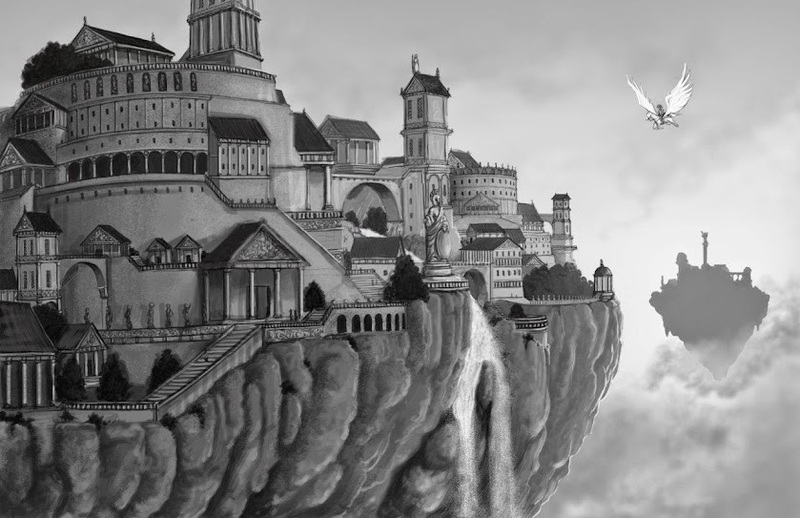 Grace of Achallon – The Demarchon calls on Achallon’s three Angels of War to imbue his men with his divine fighting spirit. A great tactic for buffing units. This allows them to roll 3 dice for attack rolls and chose the highest two. Grace of Achallon greatly increase the chances of hitting and reduces the chances of fumbling. Sudden Feat – Years of training and camaraderie enable the Demarchon to direct his troops to exe-cute surprise tactics with speed and cunning. Allows units/models to perform a tactic for free (for up to 2 ACT). This is awesome since you effectively can give units additional ACT. Or for example you let a unit of Hoplites use Sudden Feat during the Demarchon’s activation to perform Combined Attack, and at the end of the Hoplites activation let them go into Phalanx. In this way they can benefit from 2 self-tactics in a single round, which is normally not permitted! Warcry – Because the Demarchon has an unmodified POW of 4 with most of his spears, this is useful for increasing the damage he does, allowing him to re-roll one die of each damage roll. Additionally it causes the Demarchon to cause fear, which means most models need to pass a fear test or suffer -2 MEL when making attacks against him. Seraphic Shield – provides +1 ARM, making your Demarchon ARM9. This can go up to 11 when he is benefitting from his Archilochos ability, or even to an incredible 12 in combination with the Helm of the Gods item. Healing Hands – Your Warlord is usually the most important model of the warband because of his ability to buff other models and because of his awesome fighting abilities. He is also the greatest liability because he represents the greatest number of kill points the enemy can usually gain by killing one model. It therefore makes sense to invest some action tokens in keeping him healed-up to maximum. Archon Aura – A fantastic spell for a warlord which increases his LEAD range from 10 up to 16 inches (+1D6) and allows him to assign 2 action tokens to a model or unit. The Demarchon is permitted to take up to 5 items: 1 spear, 1 armor item, 1 talisman, 1 large shield, and 1 potion. All of the Demarchon’s spears have the option for making attack at RNG 2, that means a melee range of 2 inches. The Demarchon can engage enemies with RNG 1 weapons and not be counter-attacked. This is a considerable advantage since most models have RNG 1 or even RNG 0. Therefore, when you charge or engage enemies with the Demarchon you should place him 1.5 inches away, allowing him to make all of his attacks without taking damage in return. This allows the Demarchon to kill enemies in melee before they can activate and attack him, reducing the number of attacks he will suffer later when they do activate. Additionally, you force the enemy model/unit to expend an action token to move into melee range. That action token spent on movement often causes the enemy model/unit to forego one of its attacks. If for example you can force a unit of 10 models to waste an ACT moving to engage you (then you can effectively cost the opponent 10 attacks. Also when he is fighting an enemy warlord or elite model with a two-handed weapon, sometimes they only have the option to make 3 ACT attacks, and so if you force them to move they can only make one attack against your Demarchon. So always consider the placement of your Demarchon with the spear in mind. There is one exception to the above – the Paltron spear which can make 1-ACT attacks but requires the bearer to be within 1-inch to do so. Doru – The standard spear with POW 4 costing 4 points; a good, cheap option. Bronze Spear – Same as above but with POW 5 and thus more expensive. Doration of Swiftness – Bearer gains +1 Strike Rank. This allows you to perform your attack before the enemy, even if they charged you. This might seem redundant considering the RNG2 of the weapon, but if you are planning on putting your Demarchon in the Phalanx at the front where he will be charged, then this could be a good option because he potentially kill at least one model in each wave of attacks before the engagers can attack him. They say offense is the best defense, well this kind of proves that theory – kill your attacker before he even gets to attack you. Paltron – This is the one that has the 1 ACT attacks option at POW 2 when used at RNG 1. That means the Demarchon can make 6 attacks per turn – Outstanding! This can be used in some mega-combos – see unit Slaughter strategy below. Wristbands of Salvation – The first time the bearer suffers damage, all damage received is reduced to zero. Pretty cool for 6 points. Especially useful if your Demarchon will be facing the opposing warlord. Helm of the Gods – The bearer gains +1 ARM and cannot be affected by effects and damage bonuses caused by critical hits. Useful in every situation – all-time favorite of our Megalith Games Halodyne champion player! Cerberos Girdle – You can spend one action token to roll one additional die on its damage. This is more powerful than it seems. Every model has an armor value and most have an ARM of 6 or more. This means that after every hit, you need to beat get over that armor level before you can start to cause damage. So think about it. Would it be better to spend 2 ACT on causing extra damage or 2 ACT making an attack? Clearly spending the ACT on damage is considerably more effective because you have already overcome the ARM of the victim with the 2 standard damage dice you already roll. This item is particularly useful in combination with the Patron spear. The Paltron allows you to make an attack for 1 ACT. So 1 ACT for the attack, plus 1 ACT for the extra damage die is equivalent in ACT-cost to making a normal attack. With this combo you basically get an extra D6 damage with each attack! Simply awesome. It is this piece of equipment which significantly improves the Demarchon’s stats, accounting for 2 points of DEF and 1 point of ARM. As a former hoplite, the large shield is integral to his fighting skills. His background is even indicated by his ability Archilochos which allows him to benefit from a Hoplite unit’s Phalanx. Never deploy your Demarchon without a shield item! Hoplon – give +2 DEF, +1 ARM for 3 points – a great bargain and fine if you are short on points. Omegaton Spirit Shield – the only shield that does not confer +2 DEF, this one give +1 DEF and +1 ARM and protects from 5 points of damage. It’s like gaining an extra 5 life-points, but at the cost of 1 point DEF. Mirror Shield – allows you to absorb enemy spells and cast them back. Cool and I would take it if I was expecting to face a magic-casting enemy like Shadow Trolls or Magistratum. Not only this, it also gives +2 DEF and +1 ARM. For 7 points that’s pretty awesome. Spiked Aspis – gives +2 DEF and +1 ARM and allows you to make a free POW 2 damage roll per turn in melee, basically granting you an automatic hit. Great if you are up against a warlord or some enemy elites or even weak horde-units since you can kill one more model per round. Halo ward Ring – Makes models within 4 inches immune to continuous effects and gives the ability to end them automatically. When facing Beastspawn or Mortans you should take this items. Power Crystal – Gives D3 ACT one use per game. It’s quite a gamble but can be awesome when combined with other buffs, especially if you get the full 3 ACT. Amulet of Mist – Immunity to missiles and magic attacks. Take it when likely to be facing models with MAG attacks or against shooty warbands like Wyldfolk and Technostratum. Aurel Collar – Allows you to reroll 1’s on all melee attack rolls. Relatively useful. Angelic Gem – Protection roll with a 4+ save which halves damage received. If you can afford this one then take it, especially if you want to tool-up your Demarchon to be a melee monster. When you combine this with a great shield and an armor item you can make the Demarchon almost indestructible. Warlord, but the enemy elites can also charge your Hill Ogres and Demarchon. Whoever wins priority at the beginning of that round gets to charge. Wouldn’t you want to have this item with you then? Waters of Truth – Once per game the bearer gains +1 to all basic stats. Don’t forget- since the ACT’s are being generated at the beginning of the round, you unfortunately don’t get + 1 ACT. Imagine this combined with the Power crystal, giving you perhaps 10 ACT with +1 DEF and +1 MEL. The perfect combination to make your Demarchon a enemy-warlord-assassin on steroids! For even more punch, throw in the Spiked Aspis (free automatic attack) and the Cerberos Girdle allowing you to buy damage dice with ACT. Also don’t forget the +1 MOV(!) and +1 ARM. Major Healing Potion – Restores up to 8 life points. If you are going for the super-defensive Demarchon, take this one too. Several models in the Halodyne Warband work well with your Hoplites. • Hoplites – The Demarchon is the ideal Warlord for a Warband based around Hoplites since he has several relevant abilities and tactics. Also the Demarchon himself gains +2 ARM when in base contact with a unit in Phalanx, so it always make sense to take some Hoplites. His Sudden Feat tactic allows your Hoplites to perform Phalanx for free. Hoplites within his LEAD range gain +1 LEAD from his Reverence ability (making them almost unbreakable with LEAD 9 plus a re-roll). Defiant in Death negates bravery tests and allows your dead models to fight on during the remainder of the round, meaning that instead of counter-attacking, your hoplites can save their attacks until their standard activation and then make their attacks while benefitting from spells, tactics and fighting-style bonus. This can be very useful for Hoplites because they are often in the position of being charged. • Spell-casters – Although it normally makes sense to cast spells on units rather than individual models, there are some cool spells he can benefit from covered in the magic section of this article. Otherwise, consider assigning action tokens to priestesses in your warband to boost their spell-casting. Halodyne magic is very powerful and priestesses are worth investing action tokens in. • Hill Ogres are also from the same sub-faction (city-states) as the Demarchon so benefit from their subfaction ability when he is the warband leader. These guys are intensely offensive but not the greatest defensive unit due to average armor and low DEF. When buffed by the Demarchon and spells they become devastating. If you assign an ACT and let them perform their Circular Slash tactic with the Sudden Feat, they are able to make two attacks with POW 7-8 against every model in their melee range (which is 2-inches!!) as long as they score hits. Since the Sudden Feat tactic ends after performing their Circular Slash, you can even give them Grace of Archallon to increase their chance of hitting. No unit, warlord or monster can survive such overkill!! This plan is repeated from the Hoplites article because it applies 100% to the Demarchon. The Hoplite Phalanx provides an excellent wall to halt the advancing enemy. Once brought to a grinding halt, you can charge the opposing warband with your most offensive models. For this to work best, you will need a large unit of 8-10 models buffed to the max. Advance the Hoplites forward, with each retaining base contact with at least two others (so that you can activate Phalanx at any time and not need to move models around). Place the Hoplites ahead of your warband and strategically blocking the centre of the battlefield (or a scenario objective if you are playing a scenario). Make sure the rest of your warband is slightly off to the sides of the Hoplites and a little further back. Make sure they are within range to charge enemy models which engage to Hoplites next round. The perfect Formation for that is a triangle or a trapeze. With the triangle or trapeze, you present the enemy a smaller contact surface for his own attacks (which means less attacks against your models). You should still be able to attack with a lot models with your 2” spears. And the elite models in the flanks can charge the enemy cleanly without Hoplites getting in their way. If you place the Demarchon in the front position, he can absorb an immense amount of damage. He has a basic DEF of 15 and ARM of 8 when equipped with most large shields, and when you put him in base contact with two Hoplites this becomes DEF15 and ARM10 due to his Archilochos ability. With the Helm of the Gods armor item you can increase his ARM to 11. With the Waters of Truth potion this goes up to DEF16 and ARM 12 and with the Seraphic Shield spell, you can boost him to a DEF 16, ARM 13 monster for one round). Also useful for this tactic can be a Healing Potion and/or the spell Healing Hands. Also the Doration of Swiftness is very useful since you can kill enemies before they attack. In combination with the Counter Strike of the Syntarch you can take out most models that made it into melee range before they are able to perform any attack action! Place your Syntarch next to the Hoplites and place an offensive unit 6 inches behind. (An offensive unit would be ideally Hill Ogres; Sons of War are also great. Cerberoi are also possibilities. In the following round, assign an action token to the Hoplites from the Warlord and order to them the tactic Defiant in Death. Activate the unit and use their Phalanx tactic, then end their activation with 4 ACT remaining in their action-token pool. Now wait for the enemy to come to you. If possible, buff the Hoplites further with the spell Seraphic Shield (+1 ARM) making them DEF 14 and ARM 9. Keep your Demarchon at the front of the unit so that they benefit from +1 LEAD (in case the Hoplites are charged by Fear or Horror causing models). When the enemy charges they will pretty much be forced to charge the Demarchon, Hoplites and Syntarch since they will be occupying a central location, and will be 6+ inches closer to the enemy than the rest of your warband. If they do not take the bait, then see the strategy “Refused Bait” below. If the enemy does charge your Hoplites, then they will be facing DEF 14 and ARM 9 troops. If you timed it right, the enemy will charge in the round after you have placed your warband. If the enemy charging your hoplites as a regular unit such as Fjell Warriors, Reaver Tribesmen, Legionnaires, Bladelsingers etc, then just wait until all of the attacks of the charging unit are performed (without counter-attacking). Remember that with Defiant in Death, your dead models remain in play until the end of the turn. Activate the Demarchon first and let them perform Combined Attack with his tactic Sudden Feat. Then order the tactic Grace of Achallon to them (3D6 for attack rolls). Now assign one ACT to your offensive unit from the Demarchon and order to them the tactic Sudden Feat. Although the active tactic Defiant in Death ends when the Hoplites get this new ordered tactic, the effects still apply as specified in the special rule, which means the dead Hoplites are removed at the end of this round. If possible use spell-casters to heal some of the wounded, and also cast the spell Warcry on them (reroll of one damage die). Now make your standard activation of the Hoplites. When you activate your Hoplites, deactivate Phalanx and activate Combined Strike. Now if you did all the above, you will be rolling to hit with fighting-style bonus, and the highest two of 3D6 attack rolls, plus the +2 to hit bonus from Combined strike and reroll of one damage die in each damage roll. That should devastate the unit that charged you. If you activated Combined Attack with the Sudden Feat of the Demarchon, you are now able to perform the Phalanx once again. NOTE TO THE CONTRARY: The above works well against regular troops charging your Hoplites. 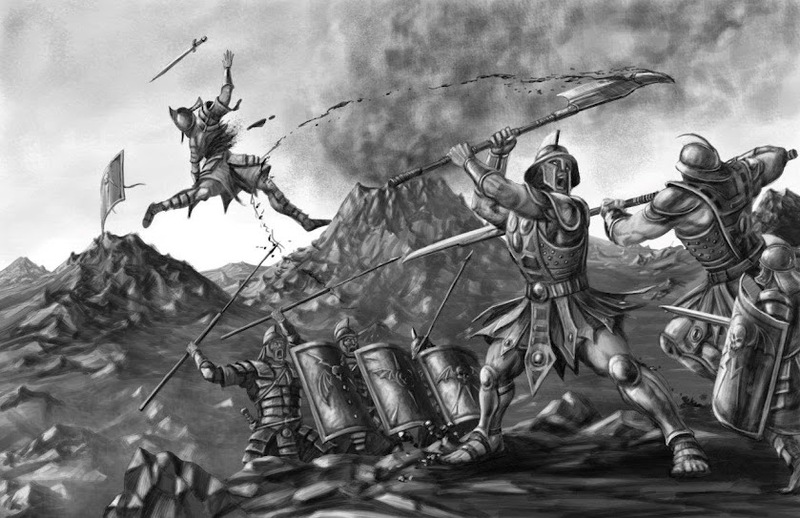 If however you are charged by a warlord and some truly devastating elite unit such as Guthackers, Carnifexors, Einherjer, Cromlech Guard etc, then there is a chance that even with your Hoplites buffed to DEF14 and ARM9, they may still be severely brutalized. In that case it can make more sense to counter-attack instead of following the above steps of waiting, buffing and then attacking during your own activation. With counter-attacks you may be able to kill some enemies and prevent some of your Hoplites from being removed at the end of the round. However, in my opinion, the above strategy works well against most attacking models and units. In addition to the above strategy, the models charging the Hoplites will have likely triggered the Counterstrike ability of the Syntarch when they came within 6 inches of him, and so he will be charging the unit which charged your Hoplites. In case the Hoplites and Syntarch did not utterly devastate the enemy chargers, then consider charging in with your offensive unit which is positioned 6 inches behind. Because they benefit from the Syntarch’s Vanguard Valor ability, and because they have an ACT assigned by the Warlord as well as Sudden Feat, they effectively have around 8 action tokens. This will enable them to make lots of attacks! If they wipe out the targets of their charge, they could engage new enemy models and make a further one or two attacks. Equip your Demarchon with the Waters of Truth – Once per game the bearer gains +1 to all basic stats. Combine this with the Power Crystal, giving you up to 9 ACT with +1 to all stats. Equip him with the Spiked Aspis (free automatic attack) and the Cerberos Girdle allowing you to buy damage dice with ACT. Arm him with the Doration of Swiftness. You now have the perfect combination to make your Demarchon an enemy-warlord-assassin on steroids! Place your warlord in a tempting position to be charged by the enemy warlord at the end of the round, and place your Syntarch/s a few inches away. Now he will either charge you or you charge him. Let’s assume he charges you. Your Syntarchs auto-matically activate in a passive activation, and charge the enemy warlord, fighting first due to the +1 strike rank. Then you get to make an attack because of your +1 strike rank. So that’s 2 attacks at MEL 8 and POW 4 plus your warlord’s attack with Normal MEL 8 and POW 4, but you can increase the damage to 3D6 because of the girdle, then you can immediately make an additional POW 2 damage roll. If the enemy warlord survived all then he can finally make his charge attack against you. When he de-clares a second attack, you get to do it all again (minus the shield attack and the Syntarchs since he doesn’t attack them). There are good chances you will kill the enemy warlord before he can make his second attack, if not, he will most likely have 3 attacks against you in his turn. Once you get to activate your warlord you can use the Power Crystal and then make 4-6 additional attacks….that ought to be enough to kill anything in the game. Let’s assume you get to charge instead of the enemy warlord. Charge first with the Syntarch and make his attacks. Now activate the power crystal, and drink the Waters of Truth then charge with your Warlord. You will have now between 8 and 10 ACT, and you will be fighting first with a POW of 5 and MEL of 10. You will be hitting most warlords on a 5+, and assuming the enemy warlord has an ARM of 9, you will be inflicting an average of 7 points damage (when using 3D6) per attack. Plus you will have your extra shield attack once during the round. So you will be able to make 3 attacks at 3D6 and perhaps even an additional normal attack, plus the shield attack. Charge a unit with your Syntarch first then the Demarchon should charge the same unit, thereby bene-fitting from Vanguard Valor. Now your Warlord will be making up to 7 attacks (including 1 slay movement attack) at MEL10 (on best of 3D6) and with a POW of 5 (with reroll). That’s a mince-meat grinder! He will likely hit with every attack, and generally cause 6+ points of damage. Against standard units like Mongrels, Kinswords, Reaver Tribesmen, Gnolls, Bladeslingers etc he will kill on model with every attack. For tougher models he should use the Cerberos girdle to add 1D6 to the damage. Against standard units, he will probably kill 5-6 models. Against elites and heavy troops he will proba-bly take out 3-4. In either case, this was a massacre worthy of an epic poem! As a note, it is best to place him in melee range with only one model at first and definitely use the Cerberos girdle for the extra D6 damage in the charge attack. This way you will be sure to kill the first model and gain Slay movement (a free attack and 1D3 movement). Now move into melee range with two models and kill them, then move once into MEL range of 2 models and kill them. In this way you protect your Demarchon from a massive amount of counter-attacks by keeping him in range of only two enemy models. So of the potential 11 ACT, I recommend to use two of them for movement and the rest for attacks (plus the slay movement of course). Although Hoplites can be played offensively they are largely a defensive unit. On the other hand, the Hill Ogres are pure offensive muscle and it’s possible to construct a warband for the Demarchon composed largely of these big fellows. Take one unit of 4-5 Hill Ogres, one Syntarch, one Priestess and two Ceberoi. Use the Cerberoi to pin the opponent’s best unit by engaging 1-2 of its models with one Cerberos. Use the second Cerberos to support the first and also try to engage some individual models too, like the enemy warlord. Then move up your Ogres and Syntarch so that they are in range to charge next round. Place the Syntarch in front of the Ogres and perform his Counterstrike tactic. You should now have most of the opposing warband pinned by the half-dead Cerberoi and be blocking charges against your Ogres with the Syntarch. In the next round activate the Priestess and cast Archon Aura on the Demarchon, allowing him to give 2 action tokens to the Hill Ogres. Then cast Warcry on the Hill Ogres, allowing them to reroll one die of each damage roll. Activate the Syntarch and charge the opponent’s elite unit. His Vanguard Valor ability will allow other models to charge the same unit, expensing one ACT less. Activate your Demarchon and assign the Hill Ogres 2 action tokens. Then use his ability Sudden Feat to enable them to immediately perform the Circular Slash tactic for free. Then Order the tactic Grace of Achallon to the Hill Ogres. Now finally activate your Hill Ogres. The tactic Circular Slash is now already active. Charge the enemy elite unit with your Ogres, placing each Ogre in melee range of as many enemy models as possible. Now your Ogres got to use their tactic for free so still have 7 ACT left, and they pay one less ACT on their charge because of Vanguard Valor. Each Ogre can now make an attack against all enemy models in melee range using Circular Slash as long as you continue to hit, rolling 3D6 and taking the highest two (due to Grace of Achallon). They will therefore hit most of the models in range. They will then make damage rolls against each victim hit with a POW of 8 (7+ charge bonus) and the ability to re-roll one die of each damage roll, hitting with an average damage roll of around 16. Unfortunately for the charged unit they will not be able to make counter-attacks because of the Hill Ogres ability Thunderous Charge. Now you can move once and get into better position since plenty of enemy models will be dead now. Then you can make a second attack with Circular Slash again. Finally after the dust has settled, you can move the Ogres once more to engage the next victims and thereby prevent them from charging you. Effectively they will have used 9 ACT this round. This is a somewhat speculative stratagem because is depends on activating several models in sequence, so it is not easy to pull off. Even so, it’s a plan that can be used as a basis for an offensive attack, even if you need to modify it half-way through. Any plan is better than no plan. This is a nasty surprise for enemies. You will need a Priestess, unit of Hoplites and a Cerberos. Equip the Demarchon with an offensive package: Power Crystal and Waters of Truth, Spiked Aspis, Paltron spear and Cerberos Girdle. Place the Hoplites in line, and leave a gap in the middle of the formation so that the Demarchon can charge through. The Demarchon should be in the gap but half an inch behind, making it look like he is hiding and waiting for the opposing warband to charge the Hoplites. The Cerberos should be placed so the furthest edge of the base is 10 inches ahead of the front hoplites. Cast the spells Seraphic Shield and Arrow Protection on the Cerberos. The opposing warband should be advancing towards you. Sustain the Seraphic Shield spell on the Cerberos. Let the opponent have the first activation. Wait for the enemy to charge the Cerberos. They should be now 11 inches from your Hoplites and around 11.5 inches from your Demarchon. Activate the Priestess and cast the spell Archon Aura on the Demarchon allowing him to assign 2 action tokens to a unit. Cast the spell Warcry on the Hoplites. Activate your Demarchon and use the Power Crystal and Waters of Truth. He now has 7-9 ACT and MOV 4, which means he has a charge range of 8 + 2 inches, plus 2 inch melee range with his spear. Now use his tactic Sudden Feat on the Hoplites and also assign them 2 ACT. Charge the nearest enemy model through the gap. The nearest enemy should be about 11.5 inches away, and you have 12 inches in total. With 8 – 10 ACT 7 – 9, MEL 10 and POW 4, he should be able to seriously cripple a unit or kill the opposing warlord/creature. Make sure to leave some nearby models for the Hoplites to engage. Your Hoplites now have 6 ACT plus they immediately perform a Phalanx tactic for free. With Sudden Feat they perform the tactic immediately! Activate the Hoplites and move 4 times (12 inches). Including their 2 inch MEL range, they should be able to engage models 14 inches away. With their last two ACT, make an attack, remembering that the spell Warcry allows them to reroll one die from each damage roll. Use Offensive fighting style so you get the +1 MEL for your attacks. Finally, the warlord should be covered in exactly the same position he was before (with the gap). Now repeat the process in round 4! (But this time unfortunately you have no Waters of Truth or Power Crystal. • Don’t let him be charged by a unit of enemy elite units!!! • Try to keep your Demarchon in base contact with two Hoplites when possible to benefit from the +2 ARM from Archilochos. The Demarchon was the second warlord created very early on after the basic rules had been agreed. As such he became a benchmark for creating other warlords. Back then he had the ability “Join Unit”, however, the rule was unwieldy and conflicted with so many basic rules that we would have needed a small book to explain how it worked. So we changed it to giving away an action token for free, and later it was renamed “Heroic Valor”. Other than that he stayed pretty much untouched throughout the development process. Some of the rules needed better defining and more exact wording but the essence stayed the same. He was designed to be a heroic military leader based more on historical characters like Leonidas, Miltiades and Xenophon rather than mythological characters (who are better represented in Wave-1 by the Godquester). He was conceived of as a leader, risen from the ranks, and we wanted him to represent the quintessential fighting style of the Halodynes, so he was armored and equipped like a Classical-Greek Hoplite. Several times we had to cut him and his items back in minor ways to bring him in line with the other warlords we had created after this prototype. The Demarchon is half-buffer warlord and half-melee warlord. The plethora of items available enables him to be tailored to one role or the other. Hoplites and Demarchon complement each other exceedingly well and it makes sense to field them together.